Whether it is Treadmills, Ellipticals, Recumbents, or Upright Stationary Bikes; our cardio equipment allows you to get into, and stay in great cardiovascular shape. 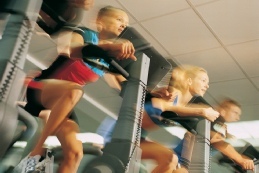 All of our Cardio Machines have pre designed programs,as well as Heart Rate Monitoring. Our strength equipment includes a 12 station Strength Machine, Circuit, as well as a Very Large Selection of Free Weights. We also offer an Extensive Selection of Resistance Bands and other Specialized Muscle Building Tools. We offer Daily Exercise Classes for all ages. Whether Yoga, Body Sculpt, Silver Sneakers, or Hip Hop Fitness, we have something for everyone. Consult the schedule on the right for class days and times. for everyone who wishes to have a healthier lifestyle. Marc is certified in Kripalu Yoga and has been engaged in yoga and health promotion for 40 years. A Nurse Practitioner, he is focused on health, fitness, well-being, and will guide your yoga practice to prevent injury and achieve optimum results. Regina DiCharia has practiced yoga since 2007. She completed her teacher training at "Sanctuary Yoga" in Gainesville, Florida. She has taught here since May of 2013. Her style of yoga is called "yoga practice," a combination of Yin, Vinyasa, and Restorative yoga. Georgia McFadden was born in Boston, Massachusetts. Originally certified by Rhythmic Aerobics out of Tulsa, Oklahoma in Aerobic Dance, Georgia went on to be certified by them in Low Impact Aerobics, Water Aerobics, and Fit For Life Aerobics for Seniors. She later became certified by the Arthritis Foundation of Florida in their water exercise program. She is also certified in Step Aerobics and as a Personal Trainer. Darlene Rivera has been leading our Hip Hop fitness class for over two years. She is employed at Keystone Heights Animal Hospital. She is married to husband William, and enjoys spending time with her family. Mandy is an Ace-Certified Group Fitness Instructor who teaches HIIT, Body Sculpt and Kickboxing. Her classes use a combination of cardio and weight training for maximal calorie burn while sculpting the entire body. Mandy has a strong passion for both health and fitness, but her first passion is living for the spread of the Gospel alongside her wonderful husband and two sons.